Being from Dayton and learning about bike polo four years ago on the same court that this tourny will take place on is why I wont miss this one. The court in Dayton is one of the very best and I think many polo players will agree with me. It’s a full size roller hockey rink with well built boards. It’s in a nice park on a hill in the East side of Dayton know as Walnuthills. This is the same weekend as the West Side Invite but that doesn’t matter much because the West and the Midwest are not that close. Also the Gem City Massacre race is sure to be well worth showing up a day early. This race is in it’s sixth year running, is well organized and Dayton is a fun city to race in. 27 teams. 2 courts. 1 day. No round robin, straight to double elim. Full sized street hockey rink with full size hockey nets. great weather. 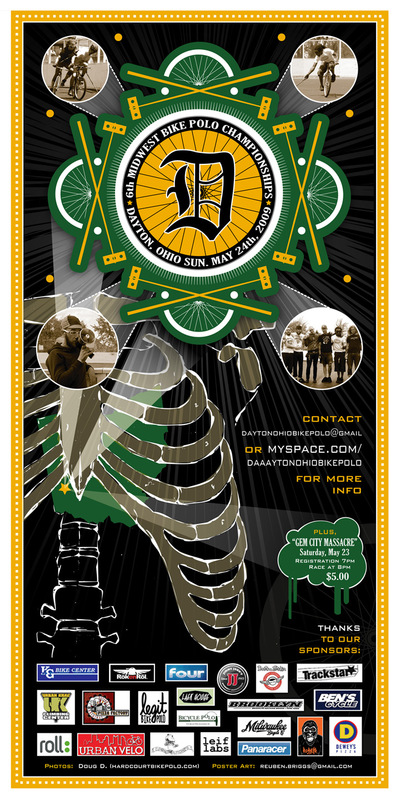 This entry was posted by Doug D on May 5, 2009 at 12:00 am, and is filled under Bike Polo, Events-Past, Ohio, Past Polo Events. Follow any responses to this post through RSS 2.0. Both comments and pings are currently closed. Thanks for updating Doug. I’ll be sure to make spoke cards too! See you soon homey. this will be a fantastic weekend. seriously. Reub, dont worry ben just means that he’s gonna make me dinner. but seriously ben, your team ate it w/o you in Boston. yea. i was frustrated to not be there. pisses me off that no one could nock the jackle off his saddle. i guess i hear rory bear was holding the team together. no one (including yourself) can step up and beat doug, including the team that has been assembled. What team is doug gonna be with to win in Dayton. He wasn’t the winner in ESPIs. Its gonna be tough for him with Mke, and Mad there. I dont care if I win polo. I want to PLAY, but winning is old hat. But I AM in it to win the race. All I want to do is go fast! I love Dayton!! doesn’t matter WHO loses. you’re still a loser in the book of life. Cannot believe that it will be happening next weekend. We are ready and we hope that you are too. If you need a place to crash contact me (eltron)@ daytonohiobikepolo@gmail.com or on MYSPACE. When you contact me I will send you an address and a telephone number. Please bring a sleeping bag and whatever you will need to sleep comfortably. Dayton is not a true city and is more like a suburb and rather easy to navigate. Friday night there will be a gathering at my house. It will begin sometime after 7pm. We will provide something to eat. Please bring something to drink and snacks will be appreciated. We will most likely leave my house and head downtown to see some of the brilliant nightlife. You can register on Friday. Saturday we will play polo from about 12-5 @ ‎330 Buchanan Ave, Dayton, OH 45410. The entry fee is $5. It will be awesome. Sunday will be the one and only 6th Midwest Bike Polo Champeenships. If you need to register please arrive around 10am so we can get it done. We will have two courts that will blow you away. They will require you to change your game. The fee is $10 a player or $30 per team. With your registration you will get an incredible t-shirt and a rad spoke card. Game time will begin @11am.